In China, the Group via its wholly-owned subsidiary Kingworld Resources Limited ("KRL") has entered into a petroleum production sharing contract with China National Petroleum Corporation ("CNPC") for the joint development and production of hydrocarbon resources in Fuyu 1 Block. KRL is the operator of the block and holds 100% working interest during the exploration and appraisal phase, which reduces to 49% working interest upon CNPC’s deemed back-in for a 51% working interest during the development and production phase based on the terms of the Fuyu 1 PSC. 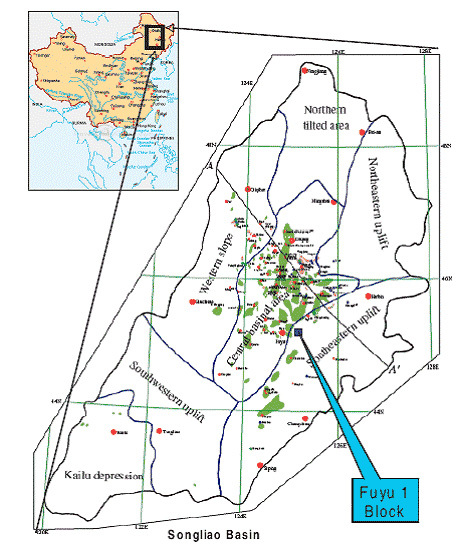 Covering a total area of approximately 254.9 km2, the Fuyu 1 Block is located to the south-east of the Songliao basin, a large intracratonic rift basin which is the largest petroleum producing region in the country. The Fuyu 1 Block was originally explored by CNPC in 1984. Though oil was discovered at that time, CNPC did not move forward on its development due to the heavy nature of the oil, as well as challenges posed by the multiple thin reservoir layers, low oil saturation, and reservoir compartmentalisation by shale barriers and faults. However, with advancements in technology and higher oil prices as compared to more than 20 years ago, the development and production of oil at the Fuyu 1 Block has become potentially viable. Due to the heavy nature of the Fuyu crude oil which has an API of 18.5°, thermal recovery methods such as Huff ‘n’ Puff and steam flooding are required for oil extraction. Under the Huff ‘n’ Puff method, steam is injected into the formation to enhance the flowability of the crude oil before production. In October 2014, China’s National Development and Reform Commission (“NDRC”) approved the Overall Development Plan (“ODP”) submitted by KRL for the development and production of the Yongping oilfield in the Fuyu 1 Block. Following the ODP approval, 29 development wells were drilled before drilling operation was suspended in 2015 as a result of the collapse in global oil prices. Since the third quarter of 2017, the Group has been conducting a small-scale production scheme on some of the wells at the field. The results of this production scheme will be used to further assess and manage the risks of the ODP implementation. For the latest update on the Fuyu 1 PSC, please refer to our latest corporate presentation.